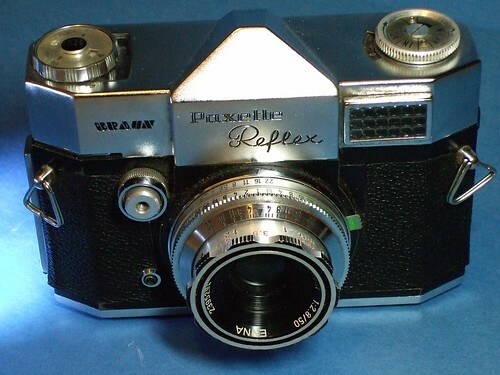 The Braun Paxette Reflex single lens reflex camera series was made by Braun Nuremberg from 1958 to 1962, broadly similar to the Paxette Rangfinder cameras. All models had a rapid film advance lever, a built-in match-needle selenium meter, a leaf shutter with V, X, and M flash synchronization, a pentaprism finder with split image focusing aid, and open aperture for focusing. A characteristic attribute is the shutter release button with remote cable thread on the front side. The camera bodies are solid metal constructions, partially covered with leatherette. Some cameras were made for interchangeable Paxette Reflex mount lenses. The simpler models had a built-in Enna Braun-Reflex-Ultralit 1:2.8/50 or an Steinheil Cassarit 1:2.8/50 lens. For the more sophisticated models a series of lenses was provided: Braun-Reflex-Lithagon, Braun-Reflex-Quinon, Braun-Reflex-Rotelar, Braun-Reflex-Tele-Ennalyt, Braun-Reflex-Ultralit, and Braun-Reflex-Xenar. The "automatic" models had a coupled meter. Some models have a bigger selenium meter window, positioned over the lens.